The Reverend Malcolm Riker founded St. John’s Episcopal Church on December 8, 1960. The first congregation was a “home church” which met in a residence on Caddo Street approximately two miles east of the present site. 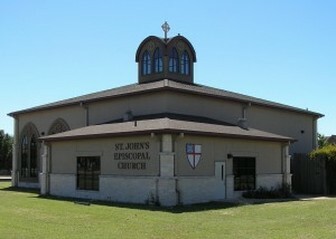 St. John’s was one of the four “Gospel” churches that Father Riker started. The church was welcomed into the Diocese of Texas as an organized mission at the annual church council held in February 1961. 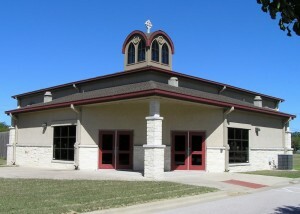 In 1963, a church building was erected at the present site on a street called “Pecusa” (for Protestant Episcopal Church, U.S.A.), which later became a part of the Parkfield Drive extension. The church grew from about 20 people to almost 80 by the time Father Riker left in 1964. In 1981 the Reverend Seth Deleery became the first full time vicar of St. John’s. Previous vicars of St. John’s – the Reverends Cooper, Jackson, Perry and Redmond – had been shared with other area churches. In 1987 the fourth and most major structural addition to the original church building was undertaken. This last addition was completed under the leadership of the Reverend Murray Powell, who became vicar in 1984 and stayed at St. John’s until October of 1992. The Reverend Paul Taft became the 8th vicar of St. John’s in December 1992 and became St. John’s first rector when St. John’s became a parish at the annual church council held in Tyler in February 1995. In February 1999, the Reverend Albert R. Rodriguez became the first priest St. John’s has chosen through a search committee. Under Father Al’s leadership, the congregation built a new worship space behind the original building. The new sanctuary was dedicated in September 2004, with Bishop Don Wimberly officiating. 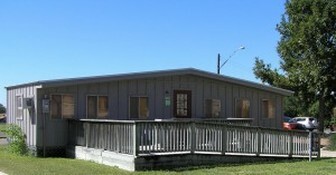 The original church building was remodeled to become the present parish hall. Following Father Al’s retirement from St. John’s in December 2013, the Reverend Dr. Matthew Thomas Seddon joined the church as Priest-in-Charge in August 2014, and accepted the Vestry’s call to become St. John’s rector in November 2014. Fr. Matt accepted a call to a parish in Mexico City, Mexico, in October 2018. St. John's is currently searching for a new rector. View of St. John's from the corner of Parkfield and Braker Lane. The main entrance of St. John's church as seen from the parking lot.